Priest crafts a bleak, dirty, wild-west type world where an evil gas called the Blight has been unleashed that can either 1) kill you or 2) turn you into a flesh-eating zombie. The Blight itself was what kept me reading. I wanted to know where it came from and if there was a way to defeat it. Unfortunately, that's not the story Priest wants to tell. Instead, Priest tells a story about a stupid, reckless teenage son, Zeke, who goes into the heart of a city where Blight is the strongest in order to ferret out some truth to rumors of his father (who is rumored to have been the cause of the Blight) and a hard-working mother, Briar, who runs into the city after her stupid child in order to save him. All this could have been avoided if only mother had told the son the truth about what happened years ago. Her alternative to telling the truth -- living poor as dirt and as an outcast in society, doesn't seem logical or better at all. I'd understand it if keeping the truth from her child meant he'd have an easier life, but that's not it. Although Zeke and Briar are supposed to be the main characters of the book, I couldn't relate to them at all. Zeke was stupid, mouthy, and always did the wrong thing at just the right time to foul things up. Using that as a device to move the plot around was frustrating to read. Briar, who I liked slightly better than Zeke, seems to go through the first half of the book with blinders on. Yes, it's frustrating to lose your son in a town of incredibly fast zombies, yes you've had a hard life, but stop and look at what's around you, woman. Her whole issue with keeping things a secret even from people who are attempting to help her really was a thorn in my side. Then there's the unnecessary racism. Maybe calling Chinese workers slant-eyes and downgrading them to less than human status gives a certain dated authenticity to the world in Boneshaker, but it's hard to believe that people would be so unfriendly and hostile to the Chinese workers who are responsible for pumping clean, breathable air into the city. You'd think with the danger of getting eaten by a zombie, the people of the city would band together better. And the ending? Well, I don't want to spoil anything, but it was pretty disappointing in a bait and switch kind of way. It was what reinforced my idea that a lot of bad things could have been avoided by something as simple as communication. I know that it's the journey that counts and not the ending, and while the journey was thrilling at times and Priest does know how to write suspenseful scenes, the lackluster ending overshadowed any good parts I could recall of the book. 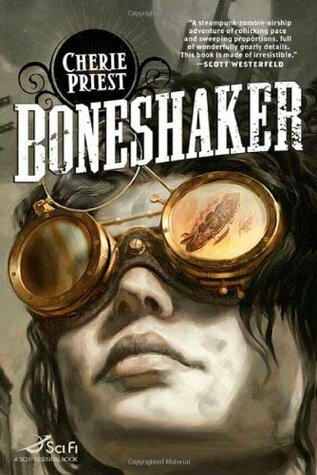 Sign into Goodreads to see if any of your friends have read Boneshaker. 8.0% "Liking it so far. Zombies in the future?" 43.0% "Not really feeling any of the characters. I wouldn't be sad if the boy died." I'm glad I wasn't the only person underwhelmed by this.